We have shown how the geometry of the Curved Space Diamond Structure can be approximated from the expanded spokes of the ball and spoke diamond model. But this model is generated on a computer aided design program, so it implies a homogeneous structure. There is no clue in these renderings how this structure might be built at the scale of our Curved Space Diamond Structure. If we wish to create our 16 million times enlargement of the diamond crystal how is it possible to do so? 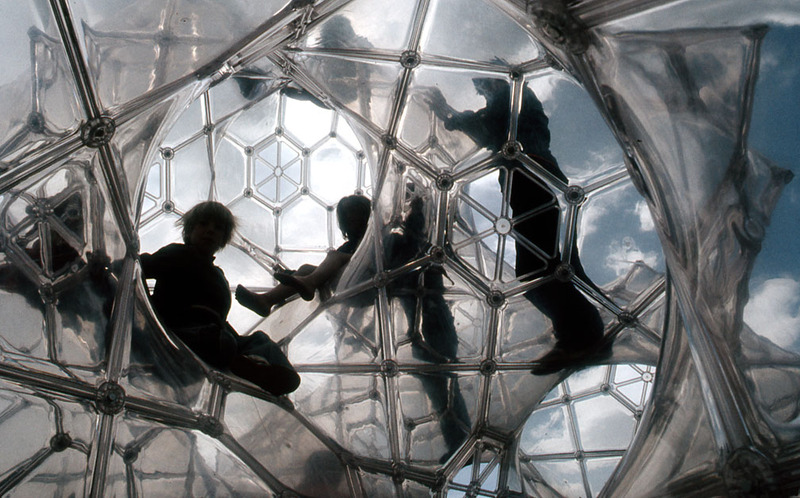 Since all things are made from parts we must find a kit-of-parts from which we can build such a structure. This suggests an orderly subdivision of the curved surfaces of the labyrinth. 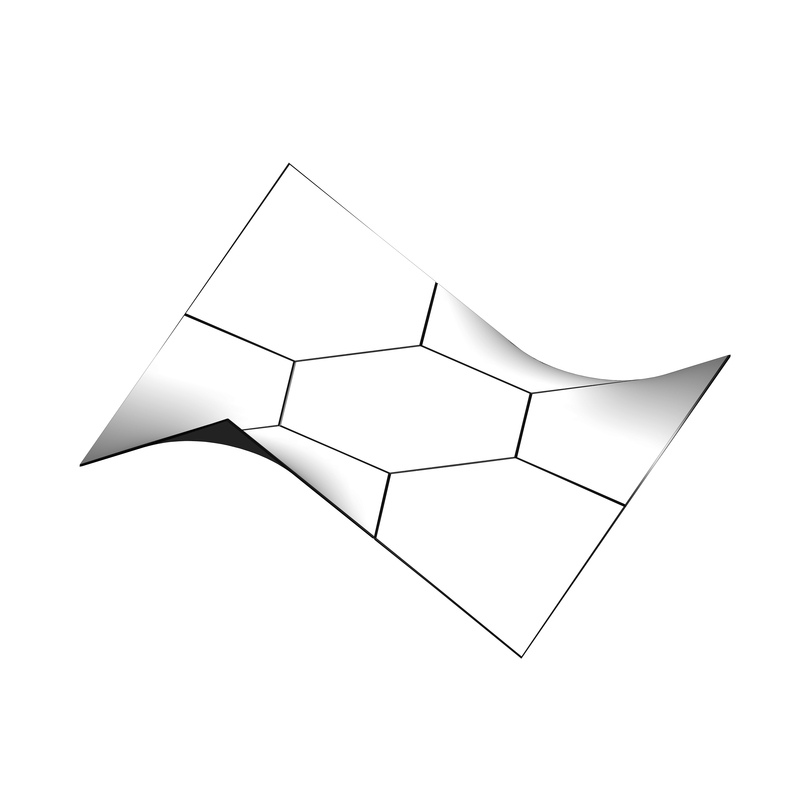 The Curved Space Diamond Structure, the geometry of which we have described in detail above, happens also to be a minimal surface. In so far that it is a geometric mapping of the diamond structure, it turns out that its curved surface subdivides space into two separate three-dimensional labyrinths with the least possible surface area for a given volume. Furthermore, the two spatial volumes that are created are congruent. That is to say they are not only of equal volume, assuming a structure infinitely large, the two spaces are identical in shape. Because the two spaces are identical they are considered self-reciprocal. 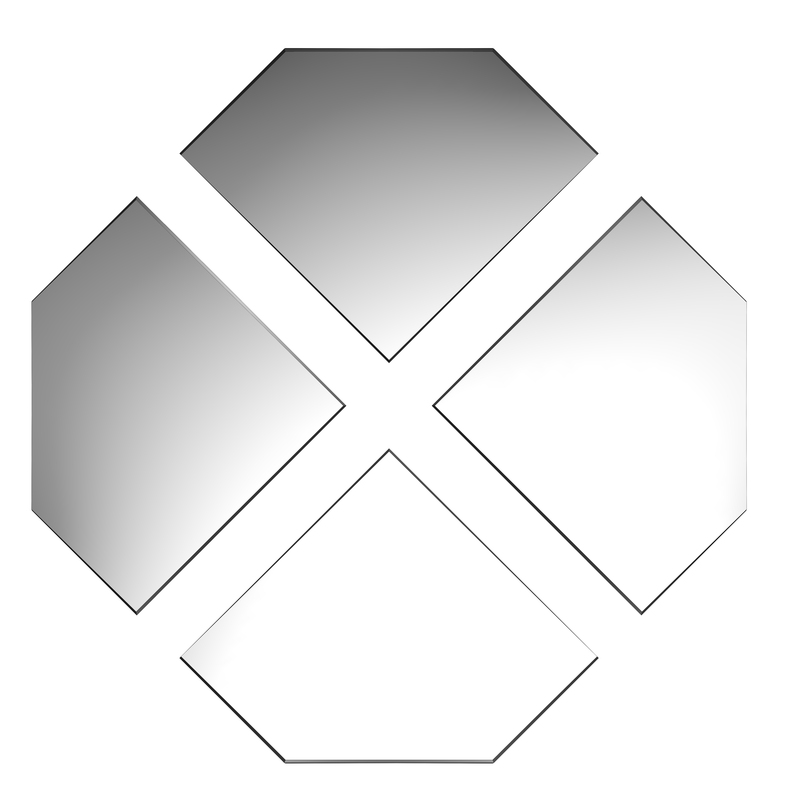 Since, as we saw early, the diamond structure is highly symmetrical and repeatable, it follows that the Curved Space Diamond Structure must be highly symmetrical and repeatable. We have seen from other repeatable patterns of structure in nature that the tiling of polygons prevails. 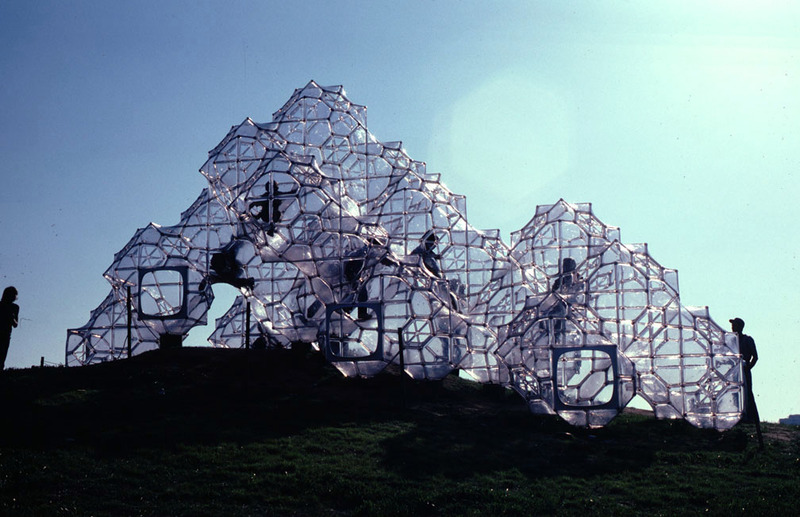 We can envision at polygonal tiling of the minimal surface labyrinth as the basis for a kit-of-parts from which we can physically build our Curved Space Diamond Structure. 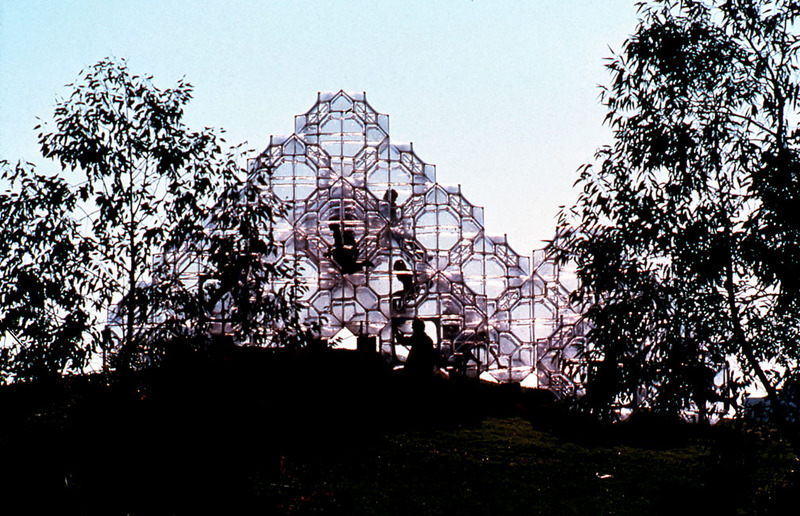 Given the actual physical size of the structures we are planning to construct, we must develop an approach that provides polygonal components of a size that is convenient to manufacture with the appropriate use of available materials. We most also keep the number of part types to a minimum in order to simplify component manufacture and cost, and to simplify assembly at installation sites. 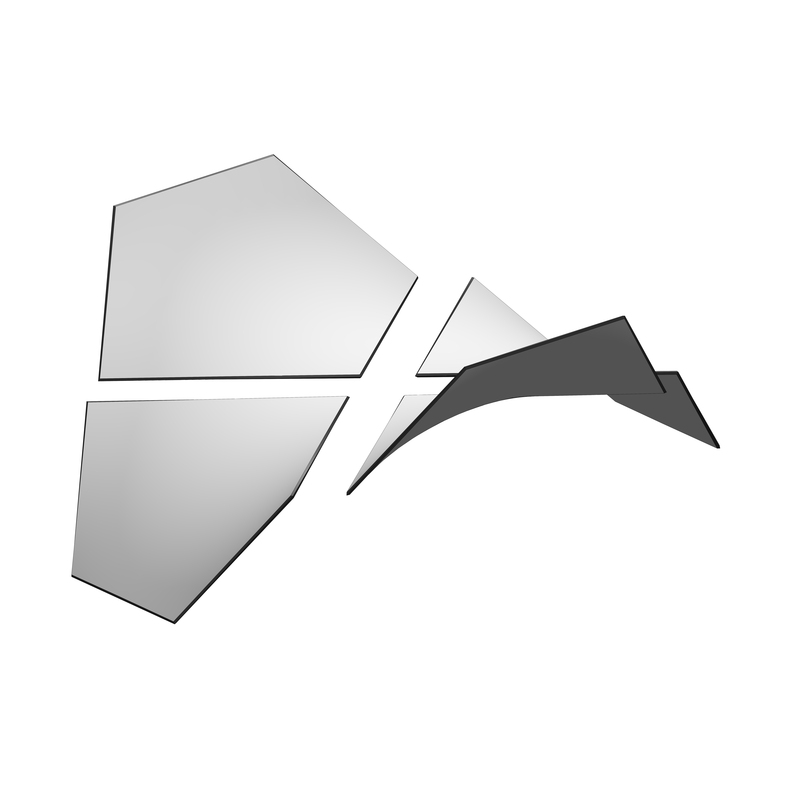 Our solution consists of two polygonal components that will tile the three-dimensional surface. 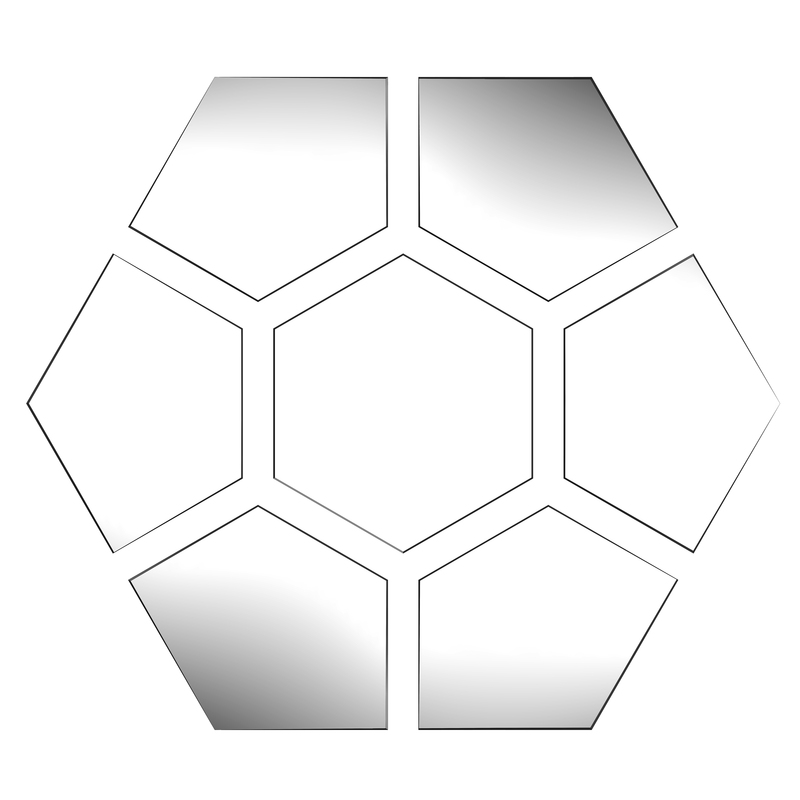 These include a five-sided module called a saddle pentagon and a flat hexagon. 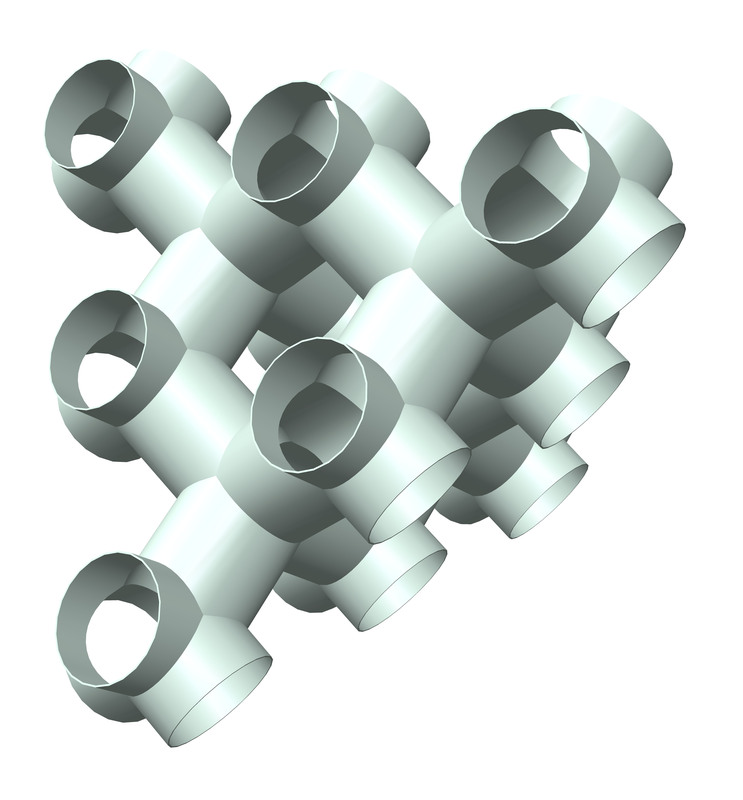 An additional component called a saddle hexagon is required for the purpose of terminating an otherwise infinite structure. 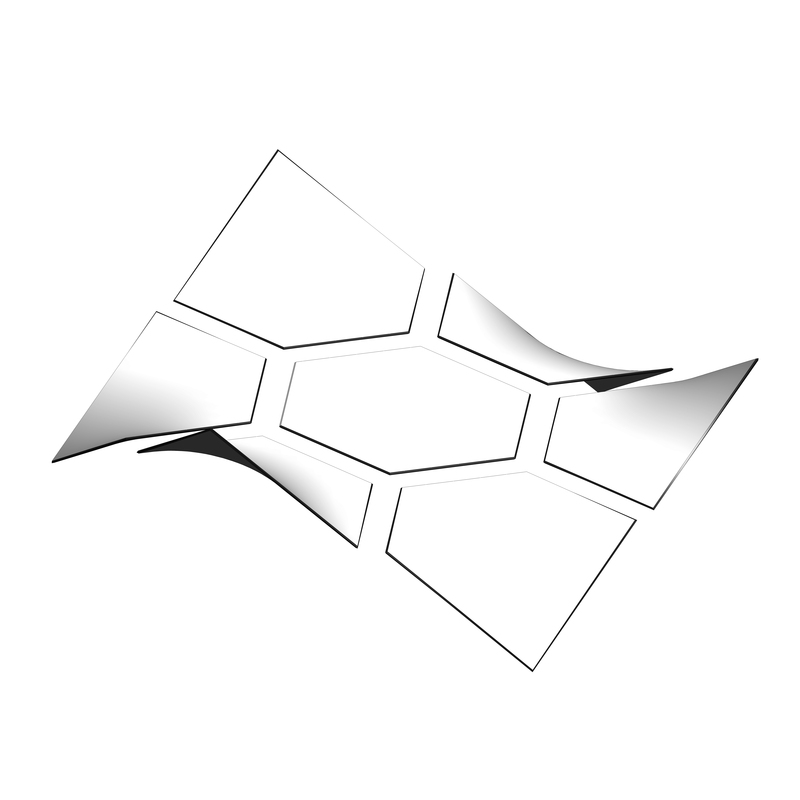 These two saddle polygons are actually themselves minimal surfaces. 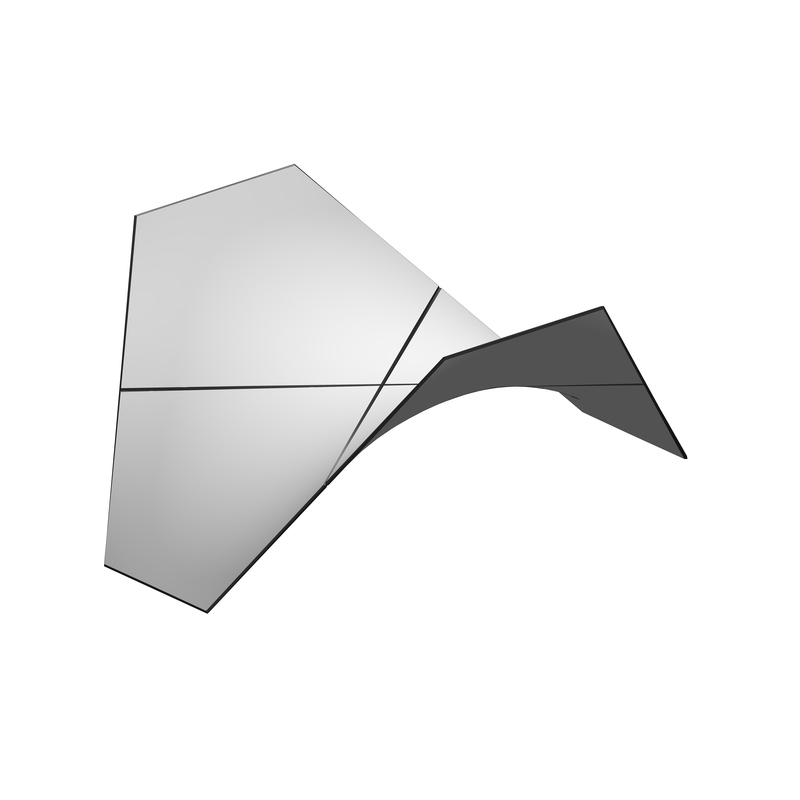 Since these polygons are not flat the minimal surface forms a saddle like shape, and therefore they may be considered saddle polygons. 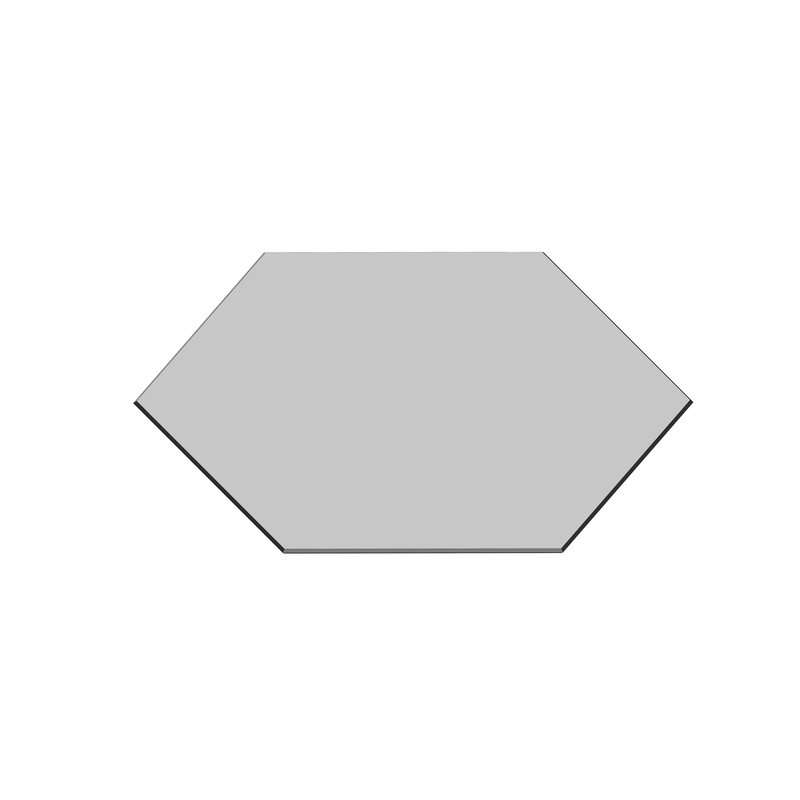 These non-flat polygons are also known as skew polygons. Like the soap bubbles we have seen above these minimal surface structures and components comprise patterns of least energy. 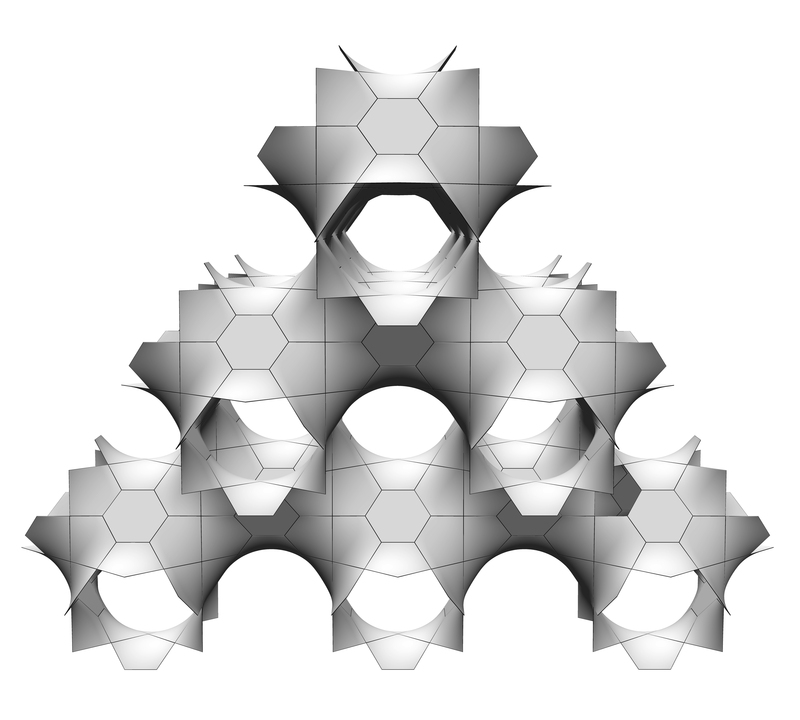 Here we see an image of the Curved Space Diamond Structure that clearly shows the tiling of the saddle pentagons and flat hexagons. 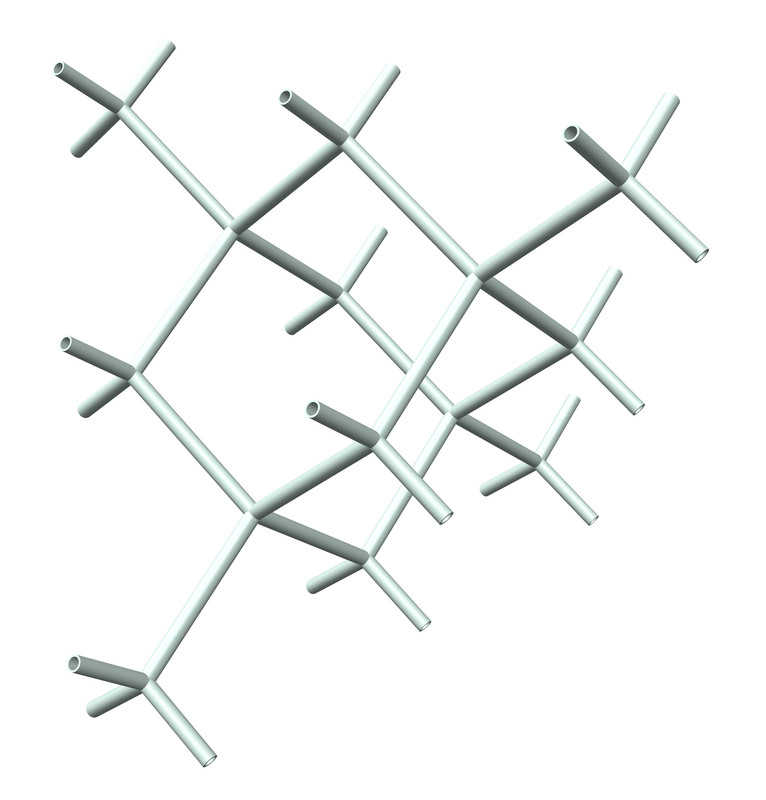 This assembly is equivalent to the unit cell of the diamond crystal. 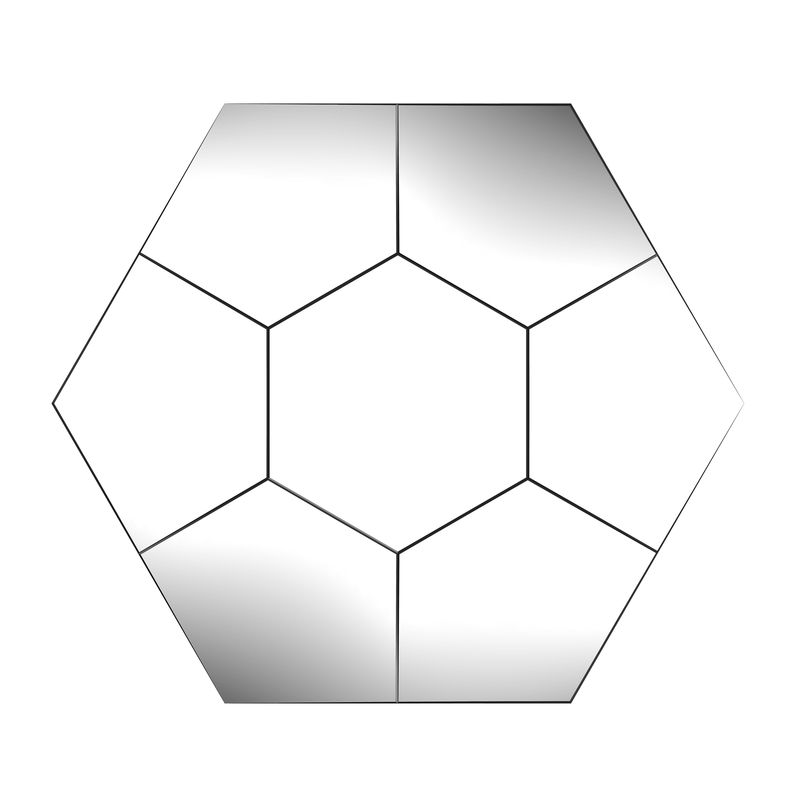 The saddle hexagon does not appear in these images since they are not terminated or closed at their boundaries. 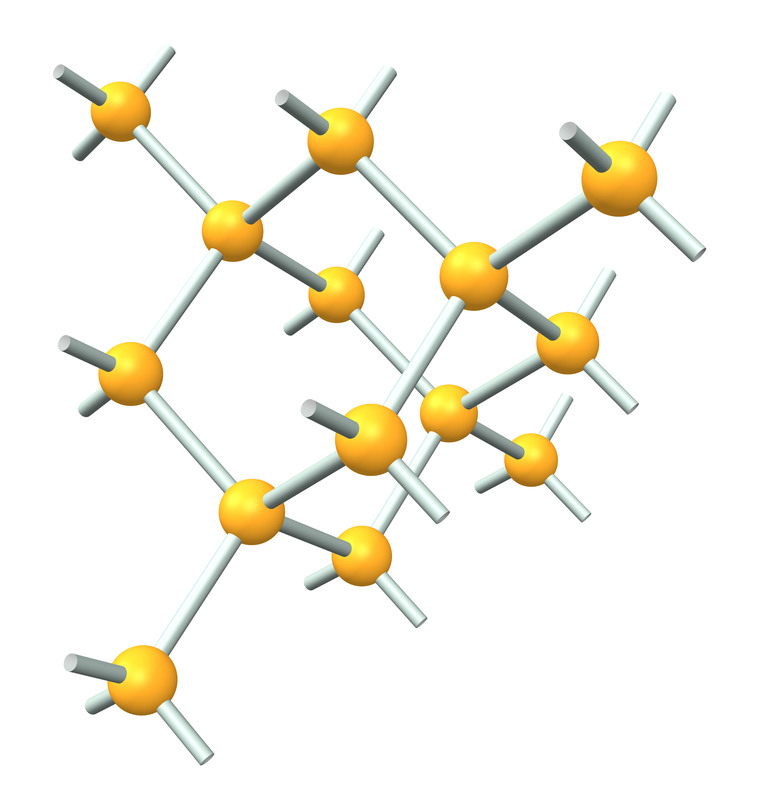 The diamond crystal unit cell. 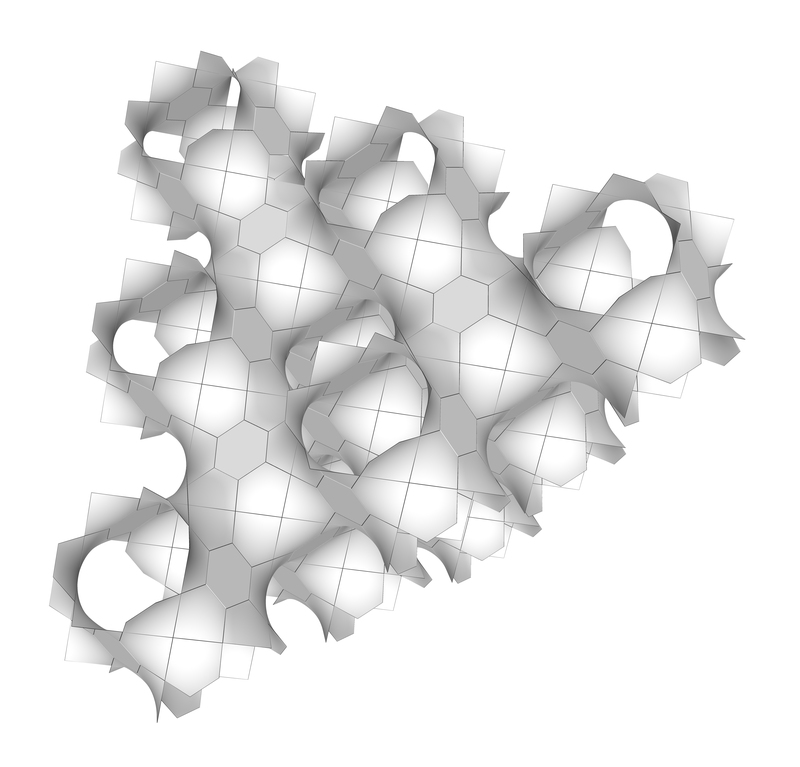 Here we see another view of the same diamond unit cell assembly, looking directly at the flat hexagons. 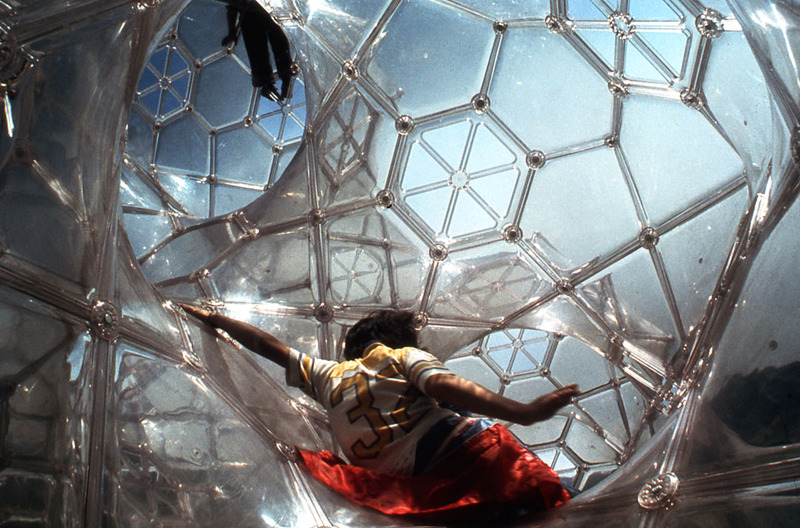 We also see the tunnel labyrinth model mapped with the ball and spoke model of the diamond crystal. 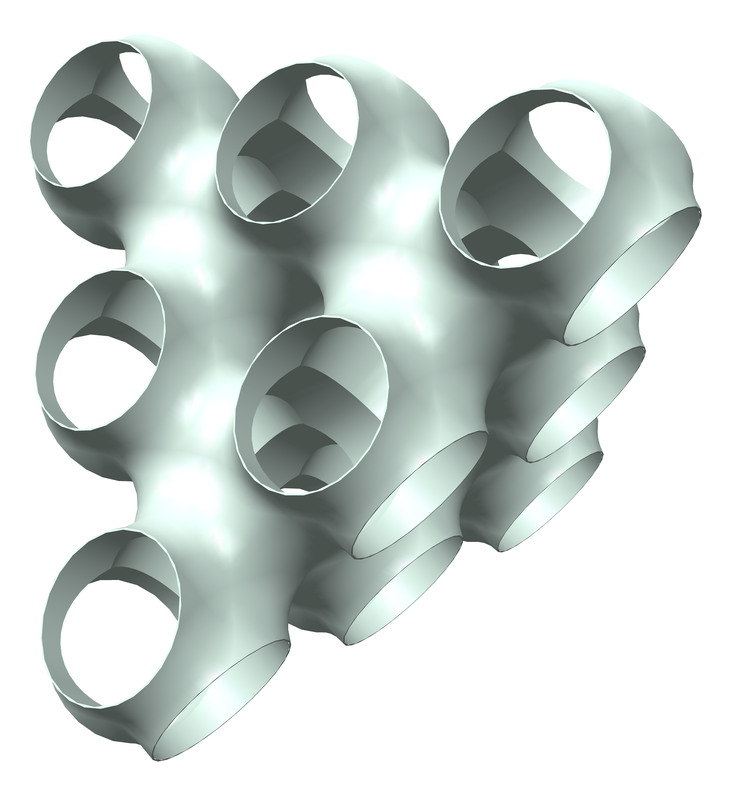 Here is yet another view of the Curved Space Diamond Structure unit cell. 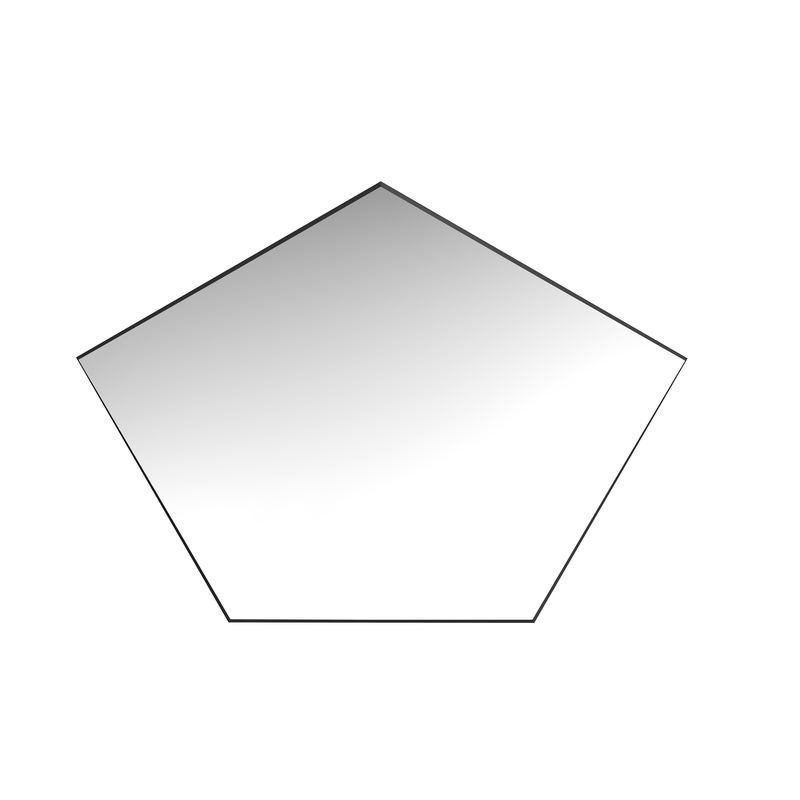 The saddle pentagon has five sides. 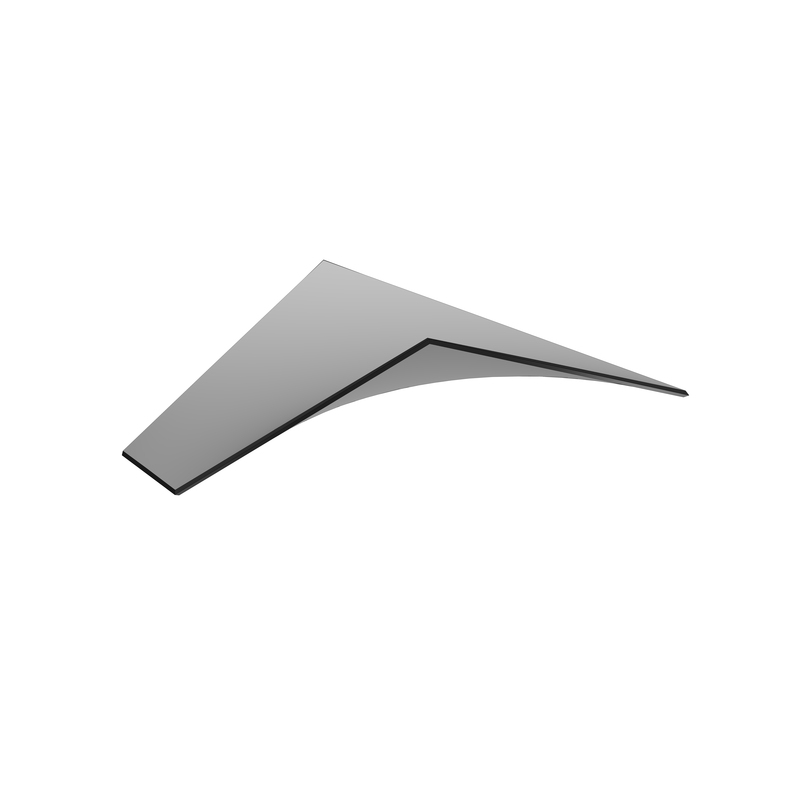 Its curved shape is a minimal surface. 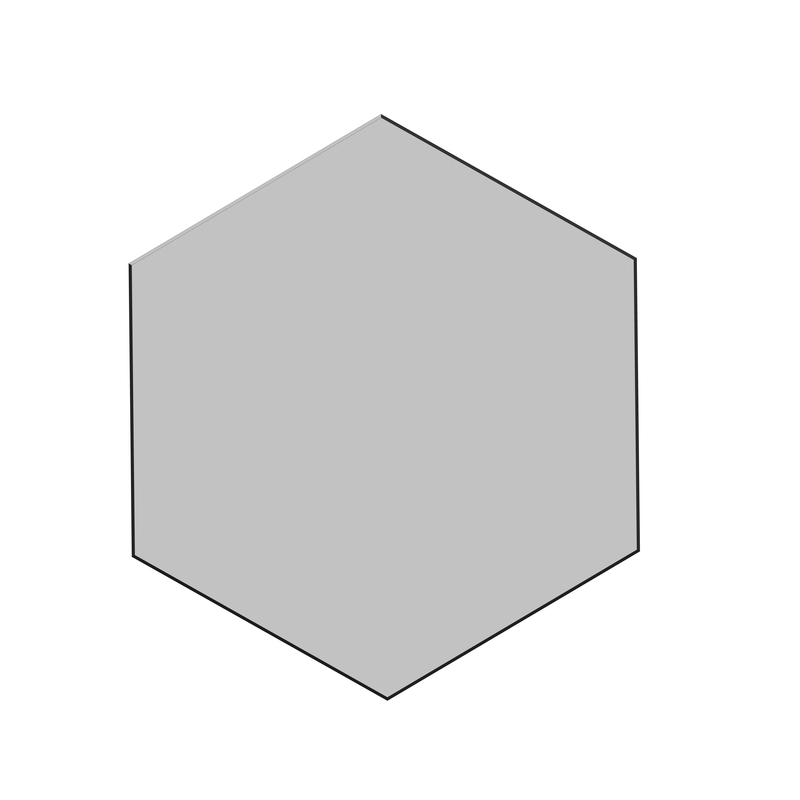 The regular hexagon. 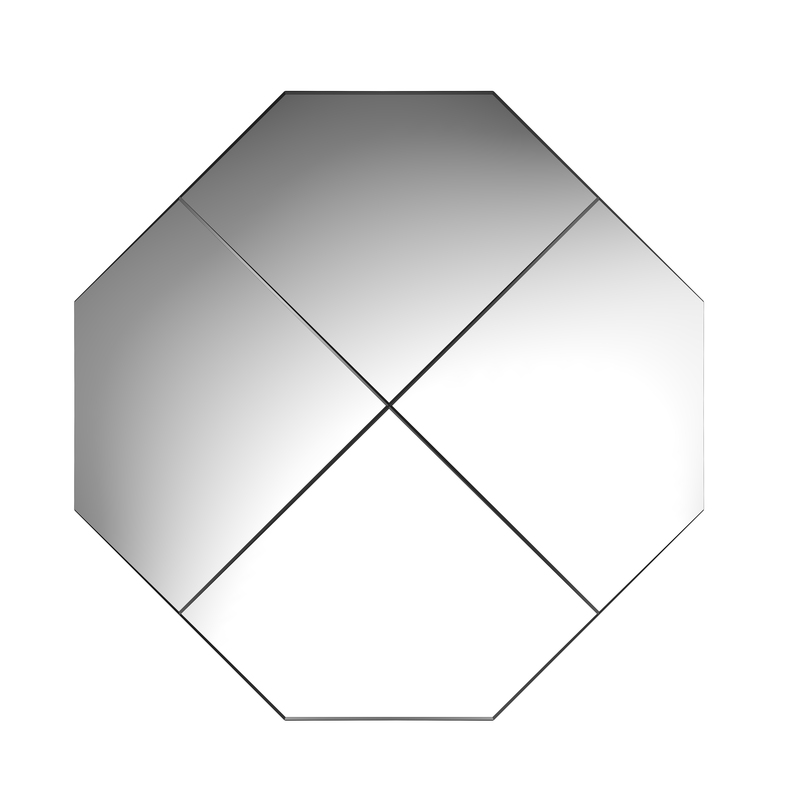 Its flat shape has six sides meeting a 120° corners. 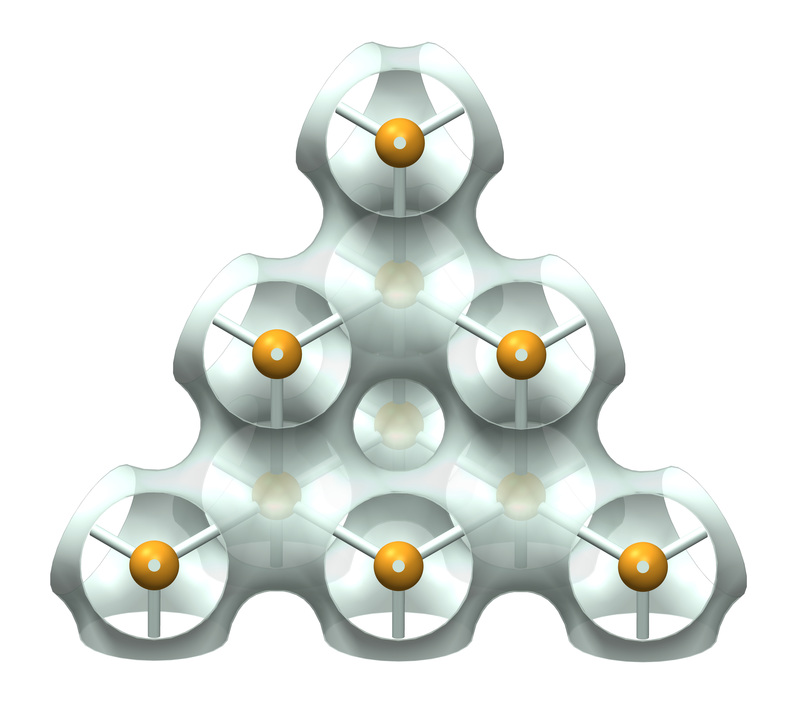 Four saddle pentagons combine to create a saddle octagon. 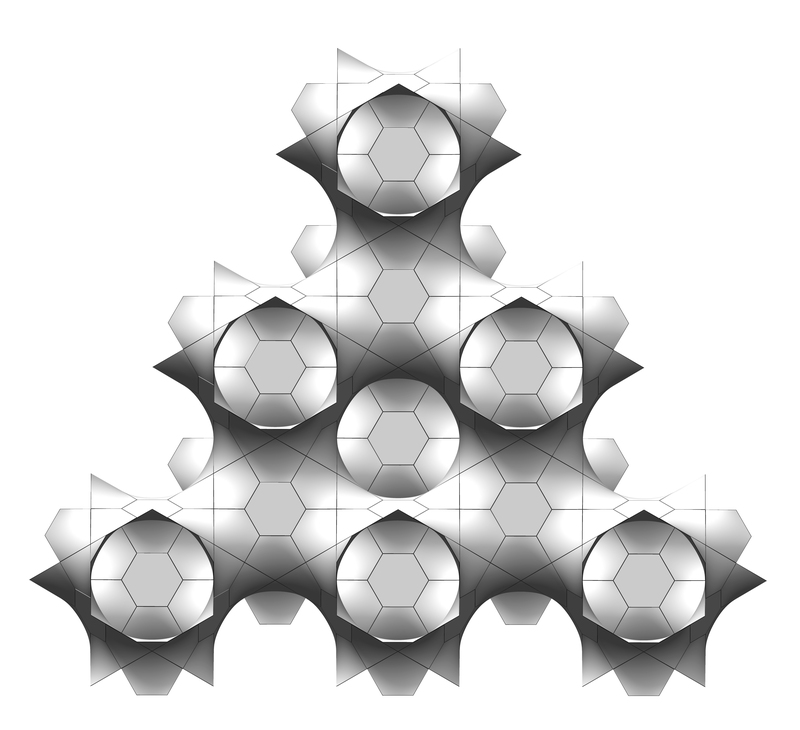 Six saddle pentagons combined with a flat hexagon.